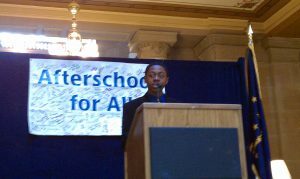 Net Literacy Student Chair was one of three keynote speakers addressing 60 members of the Indiana General Assembly and 130 Indiana afterschool program providers during the 2011 Indiana Afterschool Network advocacy event held at the Statehouse. Together with Senator Kruse and Senator Rogers, the Chair and ranking Democrat of Senate Education Committee respectively, the speakers discussed the importance of Afterschool programs as an essential component of supporting student success. Northwest High School students Reyna Perdomo and David Johnson were joined by Brebeuf Jesuit Preparatory School’s Bradford Hindes to provide the “voice of youth” to this first annual Indiana Afterschool Network advocacy event. The event was conducted at the Statehouse, and over 400 afterschool providers and 21st Century Community Learning Center attendees received training during this two-day event. The student volunteers were mentored by Intel’s Brandon King, who serves as a member of Net Literacy’s Board of Directors. Intel has supported Net Literacy’s national and international digital inclusion initiatives since 2007. Net Literacy is a member and a strong supporter of the Indiana Afterschool Network (IAN), Indiana’s state-wide afterschool network. Net Literacy serves on the IAN’s legislative and STEM committees. Net Literacy is also an Ambassador for the National Afterschool Alliance. Afterschool programs support working families, keep youth safe, and help increase student success.